The Jewelry Workshop on the corner of Whielden St. is in the Market Square section of this website. Thomas Bennett, who died in 1592, left a large cottage in Whielden Street to be Amersham’s first almshouse in 1604 “for the better habitacion of 3 or 4 widows for ever”. This property was demolished after 1840, the site then became the site for the Nag’s Head public house. No. 7 was built in the 1930s for Mr. Fuller for Bedding and Furniture in conjunction with his shop opposite. Upon his death the business closed down and with the advent of television Mr. Joe Stonnell moved from his small premises next to The Griffin to these larger premises (see advertisement below). Mr. Stonnell was a well known trader in the town and a founder member of the Amersham Town Traders Association. He and his two sons ran the business for many years. Upon Joe’s retirement the business, for a short while, changed to Cane and Pine furniture, followed by Leitch Freeland as Interior Furnishings. This business closed down in early 1985 and then re-opened in July as Amersham Travel, after much refurbishment. 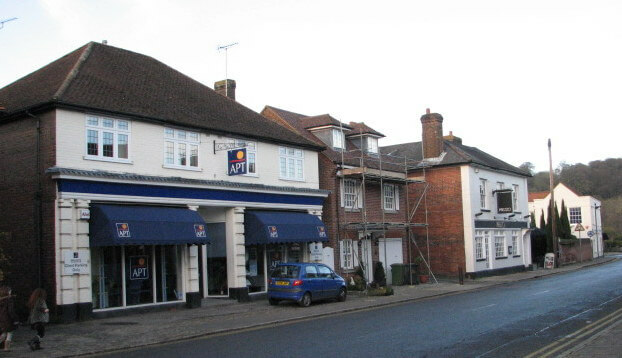 Old Amersham Travel were already in business at 8 Whielden Street but moving across the road meant they had much larger premises for their expanding business. It is now occupied by APT.